Are you looking for the best outdoor laser tag party for your son or daughter? Then you have come to the right place! Outdoor Laser Tag has come a long way in the past few years, with awesome new technology finally being developed which is lightweight enough to allow us to offer epic Laser Tag birthdays and parties for younger kids. GO Laser Tag London are at the forefront of this change, being the first venue in the UK to be running with this amazing new equipment! With the rise of ‘Fortnite’ and gaming in general, Laser Tag is hugely popular for kids of all ages. Our ‘Fortnite’ themed guns tie in with that perfectly, allowing all players to use all 3 of our different Laser Tag guns throughout their time with us – making their Laser Tag Birthday Party even more awesome. 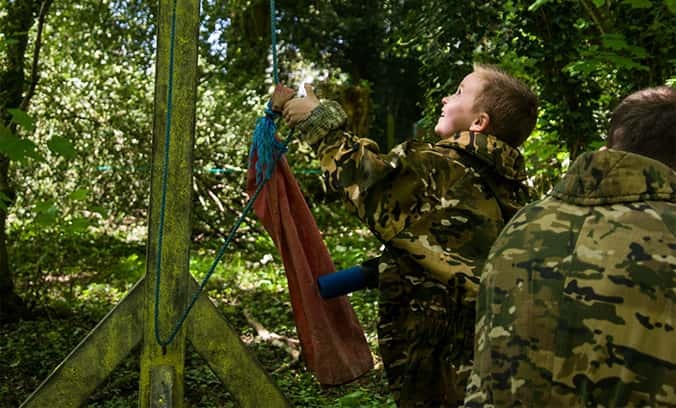 From the timid to the brave hearted, everyone can find their own style and throughout their session with us they will build in confidence, learn to work together and communicate with other kids to overcome challenges – all whilst enjoying an unbeatable day of fun and exercise at our scenic forest venue. As Outdoor Laser Tag is ‘no-impact’ (unlike Paintball), Laser Tag is ideal for kids who really dislike the idea of getting ‘hit’ with a Paintball. What makes it even better is that parents/family/older siblings can all join in also! This makes for a super memorable time for everyone involved, so instead of waiting around watching, anyone attending can get involved in the fun. GO Laser Tag London are proud to offer the most enjoyable and complete outdoor Laser Tag Party packages available anywhere. All of our Laser Tag Parties and sessions come fully inclusive and are so easy to organise. 2 hour sessions, over 5-6 games as standard – 11am–1pm or 2pm–4pm. Free 9″ Pizza Hut pizzas, a dip and a drink per person! Delicious pizzas included for free per person at the end of the session, worth £15! 3 weapon options for everyone to try. Awesome ‘Fortnite’ themed Guns – Scoped Assault Rifles, Semi-Auto Sniper Rifles and Light Machine Guns all available. Perfect to blend into the forest being a sneaky sniper, whilst keeping your clothes clean. We upload a squad picture of your Laser Tag Party onto Facebook for parents to share. Full live online availability and the ability to simply book your party online instantly for your chosen date. As always if you have any questions or queries at all, please do not hesitate to get in touch and our friendly Events team at GO Action Forest will be happy to help. Download Laser Tag Party Invites – customisable and ready to print or email!